The h in front of 8009 = homeholder. The bell between the street address and the name indicates the address has a phone (not all that common in 1938). Famous Omahans includes people from Omaha that became famous, or people that lived for a period of time in Omaha. Lawrence Welk wasn't "raised" in Omaha, but he did live here for two years (1936-1938) during his North to South route life progression. Lawrence was born and raised in the Russian community of Strasburg, North Dakota, and didn't leave home until he was 21 years old. At the time, he could only speak Russian, and was quite shy about speaking in public. In 1914, while only ten years old, Lawrence had a ruptured appendix causing him to be bed-ridden for a year. Unable to do any farm work, he learned to play the pump organ in his family's home. His father taught him the accordion during this time. After recovering, his family decided he had had enough of school, so Lawrence's early education would be considered minimal, even though he eventually became the second wealthiest entertainer of his time, succeeded only by Bob Hope. Before 17 years of age, Lawrence couldn't read music but he quickly learned as he started playing in several local dance bands. Five years later, in 1925, he formed his own band in Aberdeen, South Dakota. By 21, Lawrence was a very accomplished musician, and soon did shows on radio for free in exchange for publicity of his dance engagements. He was hired by George T. Kelly as part of his touring entertainment, the Peerless Entertainers. When the group split, Lawrence started a daily radio show at WNAX in Yankton, South Dakota. The show lasted from 1927 to 1936. During this time he met his wife, Fern Renner, and was married in 1930. Fern was from Omaha, Nebraska. Lawrence's final appearance for several weeks, probably because it was the end of summer. Notice how the original ad was crooked in the newspaper, but the top and bottom ad separator lines were straight (layout was done by hand in those days). Following the stint in Yankton, Lawrence found himself driving thousands of miles playing one-night stands. By now, Lawrence was familiar with all of the major Omaha clubs such as the Chermot Ballroom* and Joe Malec's Peony Park Amusement Center. * Lawrence figured that if he could land a steady engagement in one of the many Omaha clubs, he and Fern could have a much steadier home life. Lawrence and his new manager, Vic Schroeder, had formed a booking agency to book bands throughout the Midwest, and figured they could do a much better job working out of Omaha. Lawrence put his house up for sale, selling it almost immediately, so they packed up and moved to Omaha to start a new life. Omaha being much larger did offer greater opportunities, except musicians needed an Omaha Musician's Union card, and Lawrence didn't have one. When he applied, he was told he would have to wait for at least six months. Lawrence let in on his business partner asking him why he hadn't told him, but his partner told him that he thought that he [Lawrence] already knew. Now, Lawrence was back into the same routine of driving thousands of miles to play one-night stands ... but from Omaha. In his frustration and Fern's suggestion that it might be a good idea to get out of the business entirely, Lawrence was all for it. 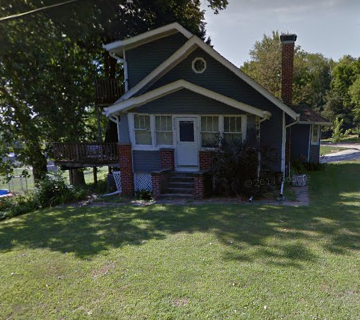 Lawrence purchased a house on a five-acre plot, and started a chicken farm on the outskirts of Omaha (8009 Miami St, Omaha, NE ( )), actually pretty close to Peony Park. The first six months was tough going, and Lawrence said in retrospect that he believed he could have been successful had he and Fern not urged friends to stop by for a chicken dinner, a free chicken, or both. Seeing profits being eaten up right in front of them, and Fern realizing Lawrence was discontent finally gave in to the possibilities of a musical career again. At the end of the six months wait period, Lawrence again approached the union office but again they claimed there was no vacancy. Lawrence was able to play one-night stands in Omaha clubs such as the Chermot Ballroom. 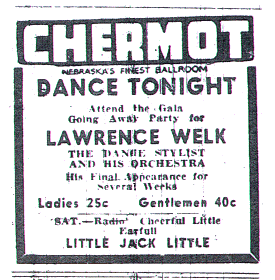 The Chermot Ballroom featured many nationally touring groups, and this allowed Lawrence's orchestra to play throughout Nebraska during these times. Often, another band would open for Lawrence's show at the Chermot, and at other times, Lawrence would be the opening act for a featured show. 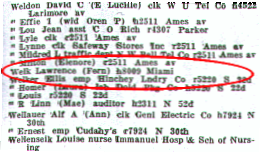 Lawrence also played in neighboring communities as the ads below show. Lawrence continued playing one-night stands, all to high acclaim, and continued to petition the union but they always had some excuse. Finally, extremely frustrated, Lawrence approached his friend to ask for help. His friend told him his hands were tied and that there wasn't anything he could do. When asked why, he was told that Lawrence was a threat to them because the union officials were also musicians, and would lose work if Lawrence received a union card. In 1938, Lawrence finally gave up on his Omaha dreams, and started considering where to move. He was becoming very popular back east, and so he moved to Pittsburgh (though he still owned his home in Omaha). It was there that fan mail suggested his music was "sparkly and bubbly" prompting the producer to suggest "champagne music" to describe Lawrence's music style. In 1938, he composed "Bubbles in the Wine," which became his theme music. During the 1940s, Lawrence often toured the Midwest, and especially Nebraska. A story goes that while driving through Nebraska, Lawrence would point out farm houses to band members and name who lived there. His vocalist at the time, Joan Mowery finally said, "Listen Lawrence, why don't you stop kidding us. You don't really know these people." Lawrence pulled into the next driveway at a farm near Hooper, Nebraska. The owner, Harry Kerstein was milking a cow. He insisted the band stay for breakfast. The band ended up staying for a typical Nebraska farm dinner as well. 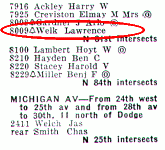 Lawrence purchased the house at 8009 Miami** from Edgar M. and Ellen M. Wegand* on July 31st, 1936 for the price of $6,500, and sold the house to Wesley A and Alice S. Laugel on June 9th, 1949 for $2 and other valuable considerations. 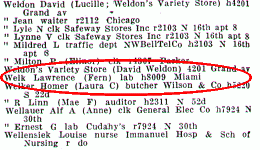 * At the time, Lawrence and wife Fern made Chicago their home. Even though Lawrence promised to return to Omaha to live out the final years of his life, his popularity on the west coast changed his life plans forever. Following his later success, Lawrence often visited his wife's family relatives in Omaha. If you look at Lawrence's life progression, it looks like he was always seeking warmer climate. That's probably the real reason why he didn't settle here. Much of the remaining history is well known, however, for even more information, visit your local library. Lawrence himself wrote six books, including an autobiography, and there are a couple other books on his life. For the really inquisitive and collector personality that would like to own an autographed copy of Lawrence's autobiography, please send e-mail. Arlington is just north of Omaha. Saturday, April 20th, 2019, 5:47 P.M. - Last modified: April 18th, 2019 at 22:39:05.